The Azeez Residence by De Earth architects strikes an elegant balance between exposure and protection and between altitude splendour and a respect for the environment. When the clouds go over the hills and the fog rolls in, the house becomes this exciting place that its inhabitants just love to live in. A pebble yard in the front announces the arrival of a different texture as it accelerates rainwater seepage. Every architect commissioned to build a house in the hills that would be sympathetic to its surroundings, faces the same challenge – how do you come to terms with the peak itself – the rock, the climate, the elevation, the slope, the vista… De Earth architects had the same inevitable urge to triumph over topography – a challenge they diverted into an opportunity to give their clients, a welcoming home back home. Spreading its wings, out over the hills and overlooking the meandering river, the Azeez residence thrusts its owners into the drama of its perch. 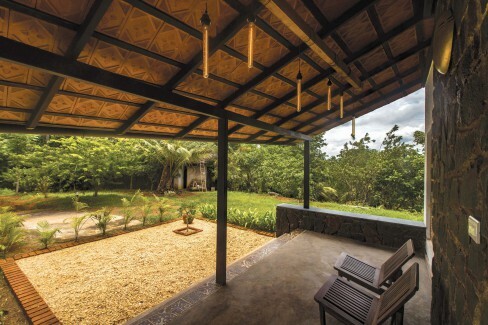 Straddling a 2878 square feet space in the coastal city of Calicut, Kerala, the house creates a unique shelter by minimising enclosed spaces and prioritising verandas and terrace spaces, where one can sit back and relax right in the lap of nature. The dining room, front and rear veranda and the upper deck are oriented such to invite maximum views of the surroundings within. Architects, Vivek and Nishan of De Earth tell us that, “The clients residing and working in London wanted a very cosy, nature-friendly home where they would feel connected with the environment when they came down for their holidays. 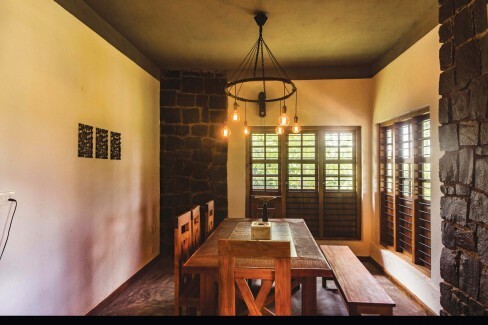 Though it’s not intended as a vacation house alone, the client was very particular about the rustic feel and fundamental finishes having an innately humane feel”. Thus the understated abode’s construction was flagged off with this principle clearly at the fore. The house wraps its inner spaces within an enclosure of uneven plastered and exposed granite walls. The plastered surface helps control humidity levels and maintains indoor temperature. The rawness in interiors is continued up to the roof that stands on simple, solid GI frames interlocked with clay tiles. The interior finishes including that of the kitchen is a diversion from all modern finishes. The reclaimed wood, broken tiles, pebbles and open shelves form the key features in the kitchen. The architectural team tells us, “This helps reduce the weight of the roof and at the same time creates unsealed spaces within. This facilitates natural ventilation through the roof as hot air escapes through the open joints between clay tiles. These are further laid in a double layered fashion wherein the bottom layer is finished in plain tiles that lend a neat and clean finish inside, reducing heat intake at the same time”. All these measures help mitigate the use of energy for temperature control. The shape of the roof allowed the architects to incorporate another intelligent feature in the house. The rain water is very cleverly channelled towards the middle portion of the house by inclining the sloping roof towards the middle. This forms an exquisite waterfall during the rains. The stone was sourced from a local quarry bringing down the travel miles incurred. 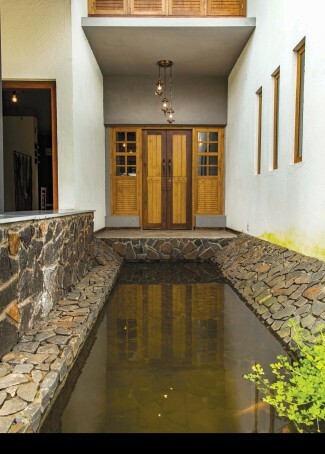 “The central part is designed as a rainwater gutter and the open drains divert into the pond. The water from the roof is harvested in this pond for utility purposes. Not only does it create a visually appealing water body with floating lilies but it also aids maximum rainwater seepage which in turn nourishes the ground water table” say Vivek and Nishan. This feature is very crucial to the house’s green credentials. A lot of local stone has been used in the project. The stone which makes up most of the exterior was sourced from a local quarry bringing down the travel miles incurred. A pebble yard in the front announces the arrival of a different texture as it accelerates rainwater seepage. Textured in cement, the floor works well with the solar design of the home as it has heat retention capabilities. It also does not harbour dust mites and other allergens typical of other flooring materials. The use of reclaimed wood not only reduces the carbon footprint further, but also perks up the rustic quotient of the aesthetics. Not only does it create a visually appealing lily pond but it also aids maximum rainwater seepage which in turn nourishes the ground water table. Maximum openings along the walls provide for natural ventilation thereby cutting down the cost of electricity once again. A mix of glass and wooden louvers on window shutters control the lighting ambience inside. The light from the West is channelled within via horizontal openings that keep the house naturally well lit. The existent natural landscaping has been enhanced by adding a vivid range of local tropical trees. Employing native vegetation is always a good idea as it doesn’t need a lot of water to sustain. Native vegetaion helps build healthy soil, and doesn’t overrun the woods and forests as is the case with foreign invasive species. Green landscapes can be maintained with compost rather than chemical fertilisers, so there’s no poisonous runoff created too. 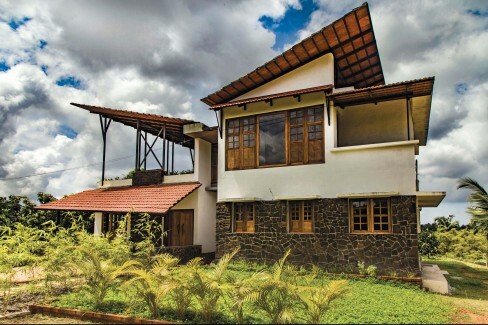 The entry features a striking laterite mount strategically shaped for vehicular entry and zoned away from the home. 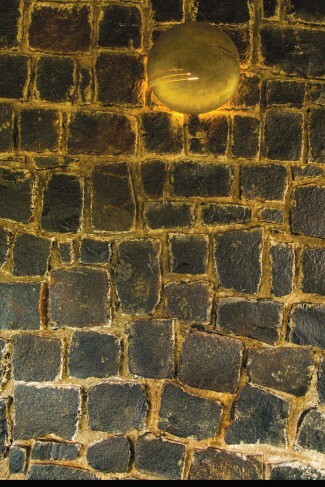 Rough granite stone pavers fringed by bamboo clusters welcome you inside the house. The interior finishes including that of the kitchen is a diversion from all modern finishes. 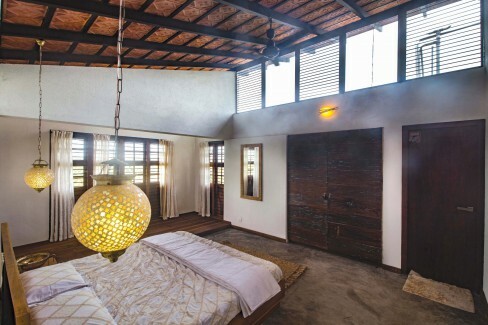 A mix of glass and wooden louvers on window shutters control the lighting ambience inside. The light from the West is channelled within via horizontal openings that keep the house naturally well lit. 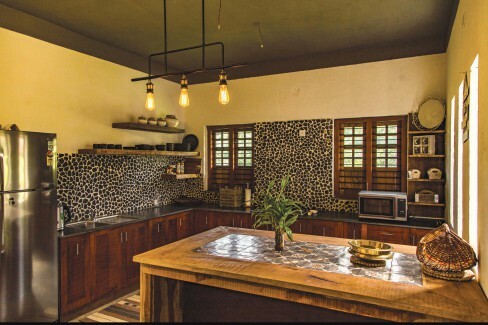 The reclaimed wood, broken tiles, pebbles and open shelves form the key features in the kitchen and further strengthen the house’s green quotient. The form of the house stands to behold as it rises from the terrain and flies to the skies in order to tap maximum light and wind. The dining room, front and rear veranda and the upper deck are oriented such to invite maximum views of the surroundings within. Keeping finishes to the minimum and avoiding unnecessary embellishments, each and every material was allowed to stand for its own character. The use of apt materials makes the project unique, rustic and eco friendly. The house not only fulfils the clients’ brief but also provides them with a home that is sustainable and full of respect for its environment.